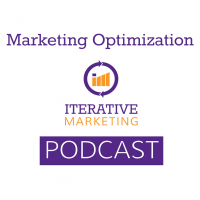 Optimizations refer to incremental improvements made over time to a marketing program. These are changes informed by data or experimentation to determine if an activity is working well or not performing. If done correctly, optimizations’ impact compound far into the future, resulting in great gains for your marketing. Studies show that marketers struggle to connect the dots between marketing and ROI. Optimizations help make those connections by showing continuous improvements to executive teams and shareholders. Experimentation and optimization is the fifth actionable component for Iterative Marketing. See the full list below.